Andy Carroll used to wear Newcastle’s number nine shirt in the playground, now the former ball boy wants to do it for real. YEARS before he left school Andy Carroll was regularly wearing Newcastle United’s number nine shirt, appearing in televised matches at St James’ Park and had a Premier League assist to his name. So heaven only knows what would have happened if he had taken the chance to join Sunderland. In truth, there was no way Carroll would pursue his grandmother’s dream of becoming the new Niall Quinn over his own to be the next Alan Shearer. Gateshead-born Carroll has been with the Magpies since the age of nine – as a player, season ticket holder and even ball boy. He knows how badly his fellow fans want him to succeed puts added pressure on his broad shoulders, but if recent performances are anything to go by, the 21-year-old thrives on it. Six goals in his last seven appearances is an impressive haul for a striker told to improve his output last summer. That his purple patch has come against the background of off-field difficulties and the arrival of a striker intent on taking his place, paints a picture of a man not easily distracted from his goals. Top of the list is the obvious one for any youngster of a black-and-white persuasion. “Everyone wants to be Newcastle’s number nine,” he says of the fabled shirt Chris Hughton has kept vacant as a carrot. “But I just want to play football and win games. We just need to get straight back into the Premier League and that is what everyone is going for. His regular stints as a ball boy had their moments – though perhaps not enough to merit the attention in the Carroll household. “I was a ball boy all the time from 12 to about 14,” he recalls. “I used to love it. And when I became too old to be a ball boy I got a season ticket. The strikers at the time were Alan Shearer, Les Ferdinand and Duncan Ferguson. “There was one game – I am not quite sure which one – when I went home and told everyone I had set a goal up. I threw it in quickly and they scored. With his giant frame accentuating an unerring ability to hang in the air, Carroll’s game is closest to Ferguson’s, and his aerial prowess not too far removed from the more diminutive Ferdinand’s. But inevitably there was only one striker he had eyes for. “It was Alan Shearer I always modelled myself on,” he says. “I think everyone did really. Just Shearer. He was sheer class, scoring every week with his head and feet. It was his hold-up play and his influence on everyone around him. “I would like to be known as an all-round striker but if I score all the rest of my goals with headers I will take them.” The future England Under-21 international trained with Sunderland as a youngster, but there was never any question of him doing the ‘dirty’ on his beloved club. “I have been at Newcastle since I was nine,” he says. “I was at Redheugh Boys' Club, then moved to Low Fell Juniors. “I got invited to go to Sunderland and Newcastle the same time. I was training on a Tuesday at Newcastle and a Thursday at Sunderland. Life has not always been plain sailing for the striker whose initial taste of first-team football, on loan at today’s opponents Preston North End, was a tad bitter. 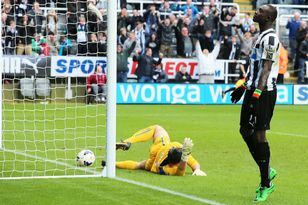 But like many in the Magpies squad, relegation has suited Carroll. “My time at Preston was up and down,” he says. “I didn’t play as many games as I wanted (11) and only scored one goal but it was good experience to be round the first team at 18. Being with the squad was good experience for me. “It was a bit disappointing. Preston were in bit of trouble and the manager (Rob Kelly) got sacked. It was chop and change for everyone. “If we were still in the Premier League (Michael) Owen might still be here, Oba Martins, (Mark) Viduka and Sholes (Shola Ameobi), so I would have been fifth choice if they hadn’t brought anyone else in. Since the FA Cup clash with West Bromwich Albion Carroll has really stepped up a gear, however. “It is just down to playing regularly,” he says. “And we have more players for the two positions. Leon Best has provided more competition so you have to work harder. I am not trying to be more selfish in front of goals, it is just the ball is coming to me where I want it and I have been putting them away. Moving from the sidelines to centre-stage has been good for Carroll, but the hope is that there is much more to come. ALAN Shearer has warned Andy Carroll that he still has to prove he is worthy of Newcastle United’s famous number nine shirt after a hugely encouraging season in the Championship.